IT CAN be hard to keep your spirits up when you have ridden 1500km up the east coast by yourself and you are not even half way yet. 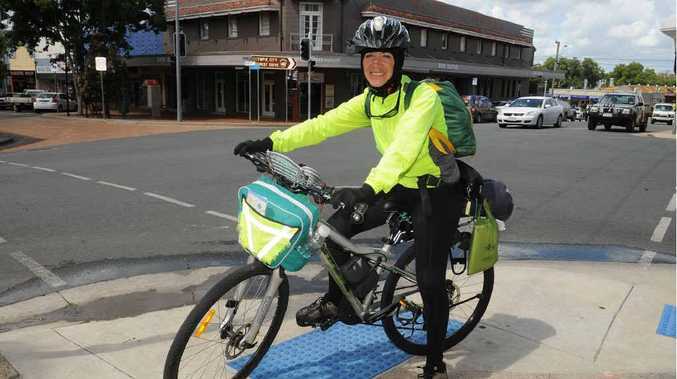 For Sydney woman Bertha Corte, 54, who left her home on February 19 her journey cycling around Australia was even more challenging when Queensland was soaked with heavy rain recently. "It can be very hard. It was raining heaps, I was cycling in a big storm," she said in Gympie yesterday. When she made it to the Gold Coast the rainy weather hit, by the time she was in Brisbane Mrs Corte was starting to feel the effects of riding in the cold and wet and felt like stopping. "But I can't stop," she said. Her main reasons for pushing on are her supporters in Mexico and her sponsors, that and there is no one to drive her home! The Mexican-born woman hopes with this mammoth cycle around the nation she can change the perception about her country of birth. She came to live in Australia two years ago and since then has found people's perception of Mexico pretty low. "People think it's full of crime, drugs and corruption," she said. During the journey she will also reduce her ecological footprint, all she has with her is a backpack, sleeping bag and change of clothes. "I never believed I could ride more than 60km a day, now I can do 90km," Mrs Corte said. For her husband it has been a journey of mixed feelings, from being supportive to wanting his wife at home. Even though Mrs Corte has an iron will to push on she said it was hard at the start. "It's pretty hard. I go slowly. You have to be consistent, I have all day to do it." Last week on the way to Gympie she had her biggest set back, she took a wrong turn and didn't realise her mistake until 20km off track. That put her back 24 hours in the 200-day 14,500km trip. Riding on the Bruce Hwy was not daunting for her, she has learnt to be careful and has a special mirror attached to her helmet. To follow Bertha's progress, visit tbomx.com.